DALTON, Georgia - Armstrong Flooring will relaunch its popular What's the Big Deal promotional contest on 01 April with the official title What's the Big Deal Spring 2009 Retail Salesperson Stimulus Package. That mouthful aside, Armstrong is offering nearly US$40,000 in cash prizes during the three-month sales promotion, and a host of other incentive prizes such as a five-day cruise, an Apple iMac, an iPod Touch and Taylor Made golf clubs. Armstrong boasts it is giving retailers a chance to win their choice of more than three million prizes ranging from concert tickets to consumer electronics. Armstrong has unveiled this poster to promote the spring 2009 edition of its 'What's the Big Deal?' contest. Armstrong polled its dealers after last year's promotion and found 93 per cent of respondents would participate in a second round of the contest. More than 80 per cent of dealers surveyed said the contest encouraged them to promote Armstrong products to their customers. According to the company, the contest also generated retailer interest in product training and other programs, and strengthened the manufacturer-dealer relationship. 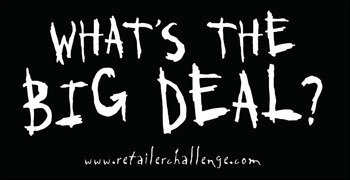 All retail flooring salespeople are eligible to participate in What's the Big Deal 2009 by registering at www.armstrongrewards.com. Players earn points by selling eligible Armstrong wood, laminate and sheet vinyl products during the contest. Monthly $1,000 cash prizes are awarded throughout the competition and three $10,000 grand prizes will be awarded to the top sellers in the wood, laminate and hardwood categories. Sign-up will continue throughout the competition. Participants can log on to www.retailerchallenge.com for details, including how to play, eligible products, various prizes that can be earned, and rules and regulations.